Carolyn’s Shade Gardens is a retail nursery located in Bryn Mawr, PA, specializing in showy, colorful, and unusual plants for shade. The only plants that we ship are snowdrops and miniature hostas. For catalogues and announcements of events, please send your full name, location, and phone number (for back up use only) to carolyn@carolynsshadegardens.com. Click here to get to the home page of our website for catalogues and information about our nursery and to subscribe to our blog. 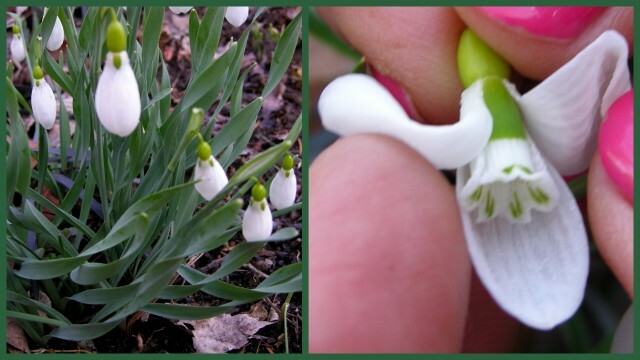 Every photo in this collage is of a giant snowdrop, Galanthus elwesii, in my garden. The differences in the markings are caused by the natural variation in the species. None of them have been selected and given a cultivar name, although many plants like them have been named, probably too many. Yet I find this variation fascinating. To access the 2019 Snowdrop Catalogue, please click here. 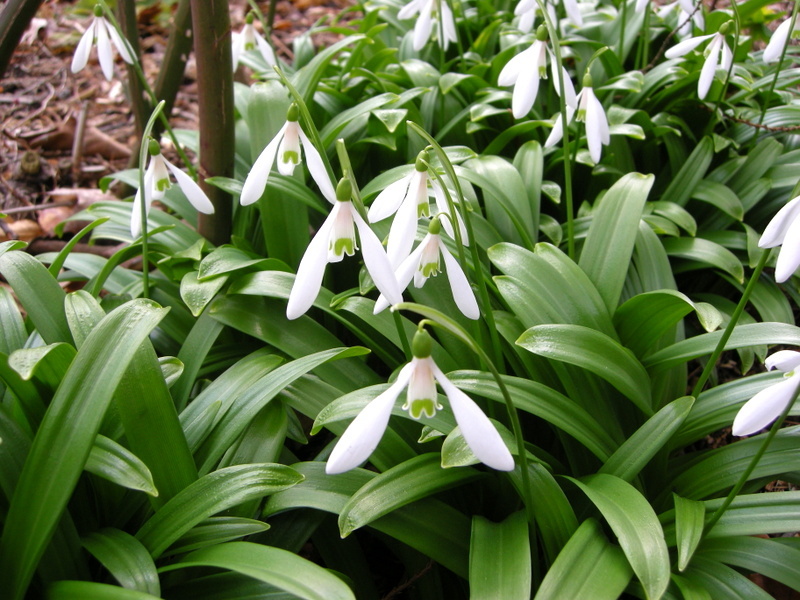 To be put on the special snowdrop email list, please send your full name and cell number for back up to carolyn@carolynsshadegardens.com and indicate you are interested in snowdrops. 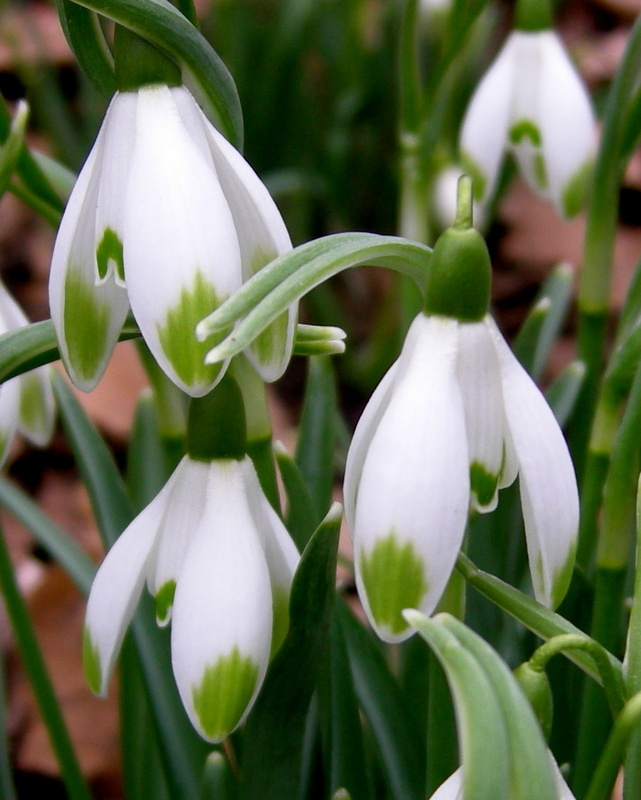 In this post you will find links and descriptions of every post I have written on snowdrops. 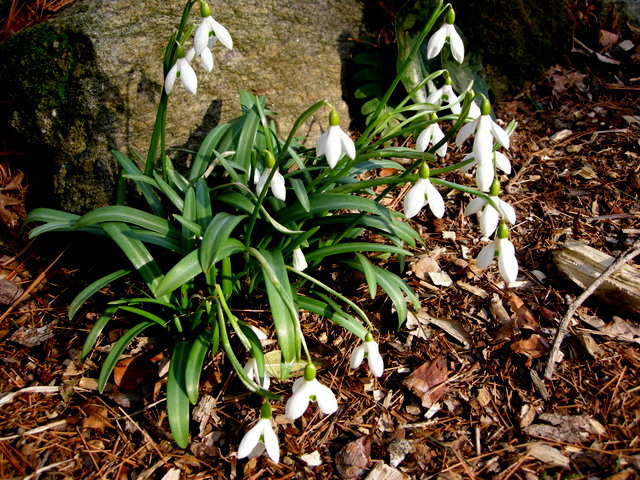 The original purpose of this post was to let readers know that The Hardy Plant Society Mid-Atlantic Group honored me by asking me to write an article on snowdrops for their newsletter. It is called “Confessions of a Galanthophile” and is the Feature Article for the January 2013 Newsletter. You can access the on line version by clicking here. While letting you know about the Hardy Plant Society article, which makes use of parts of some of my previous blog posts, I thought this post would be a good place to list all the articles that I have written on snowdrops for easy reference. 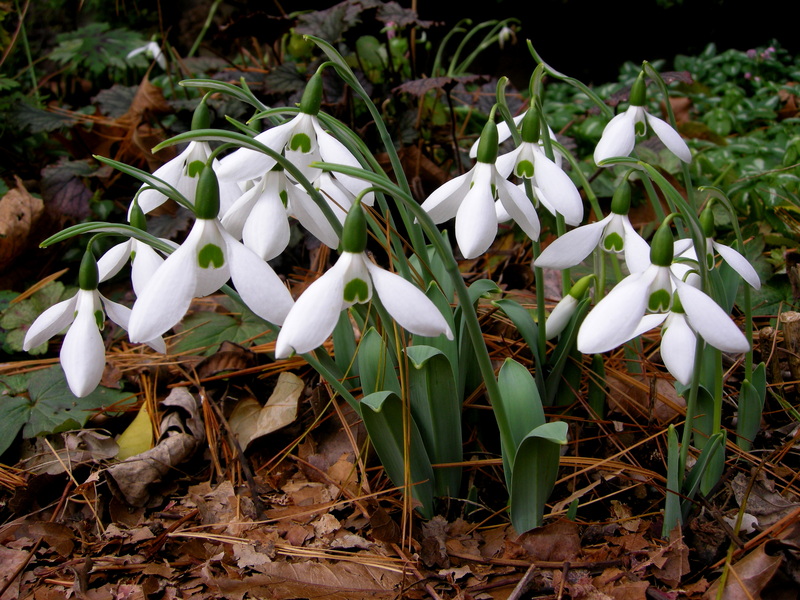 I have interspersed the article names and links with photos of some of my favorite snowdrops. A very unusual and pricey newer snowdrop with squared off outer segments, ‘Diggory’. G. reginae-olgae blooms in the fall with ‘Shell Pink’ lamium. The shiny bright green leaves of the species snowdrop G. woronowii. The lovely American, fall-blooming snowdrop ‘Potter’s Prelude’. My favorite single classic snowdrop, ‘Magnet’. ‘Kite’, very early-blooming with extremely long outer segments. ‘Kite’ can have twin flowers on one flower stalk. ‘Godfrey Owen’ has six outer segments. 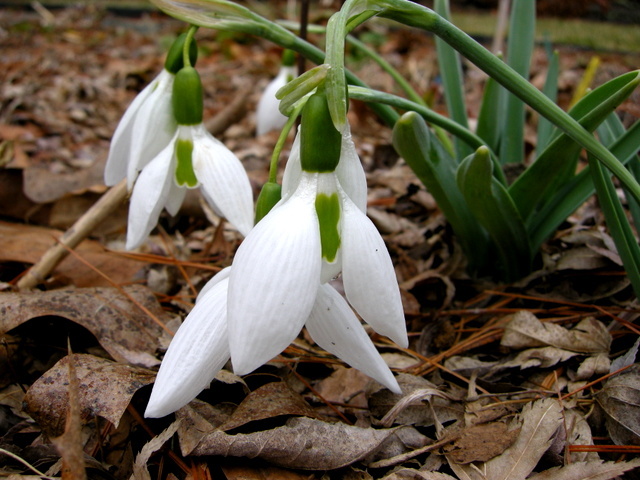 Although considered ordinary by some, ‘Viridapice’ remains one of my favorite snowdrops. ‘Cowhouse Green’ is a lovely part virescent snowdrop. 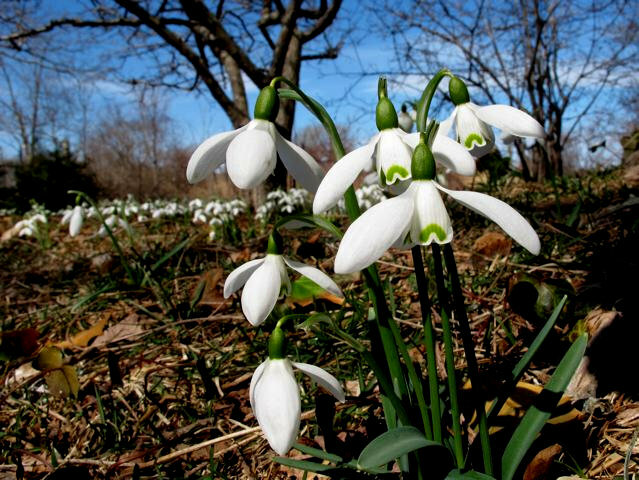 ‘Walrus’ is ranked number 12 in all-time favorite snowdrops. 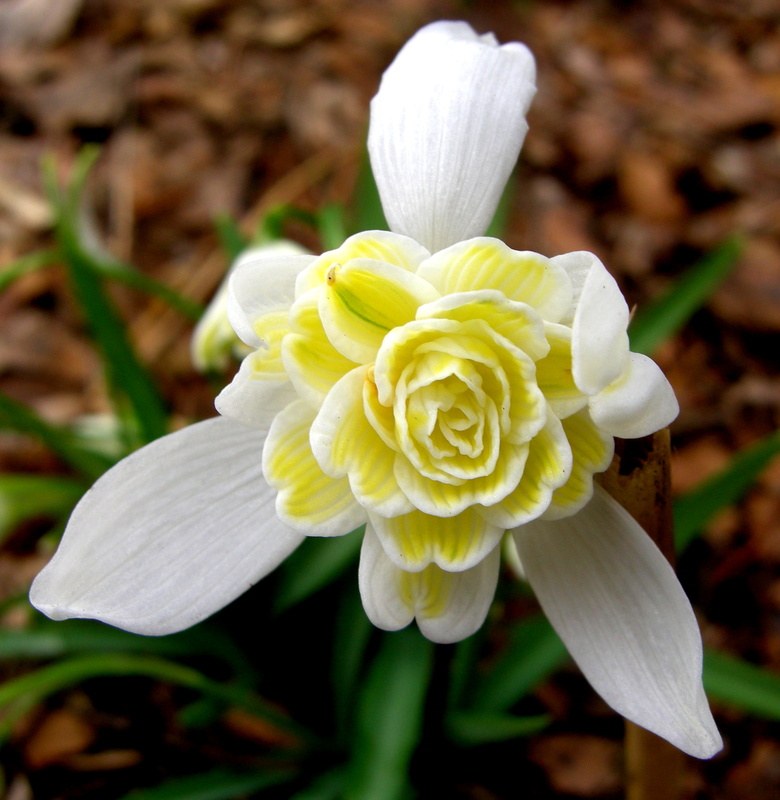 An unusual form of spring snowflake with yellow markings, Leucojum vernum var. carpaticum. Some of my special snowdrops that I want to keep well marked. The naturally blue lake at Colesborne Park below a hillside of snowdrops. ‘Lapwing’ has a great mark and is a vigorous multiplier. Snowdrops and hellebores along the path to a folly at Painswick. John Morley welcomes us to the gardens at North Green Snowdrops. The best place to see snowdrops in England is Colesbourne Park in the Cotswolds. Rodmarton Manor has an extensive snowdrop collection in its Arts and Crafts garden. 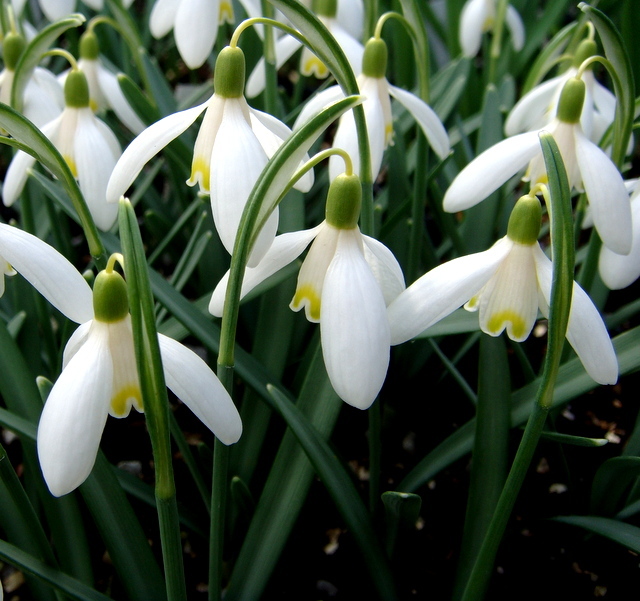 ‘Sprite’ is a beautiful and distinct snowdrop selected at Avon Bulbs. ‘Art Noveau’ has a unique and elegant look. ‘Richard Ayres’ is a large and vigorous double. ‘Madelaine’ has gorgeous yellow markings. ‘Blonde Inge’ is lovely in a mass and bulks up quickly. All the posts as well as the catalogue itself, provide interesting and informative reading on subjects ranging from the origins of galanthomania, the fascinating history of snowdrops, their provenance, how to research them, and even whether they produce their own heat. I intend to add titles and links through the years as I write more about one of my favorite topics. Carolyn’s Shade Gardens is a retail nursery located in Bryn Mawr, Pennsylvania, US, zone 6b/7a. The only plants that we mail order are snowdrops and miniature hostas and only within the US. If you are within visiting distance and would like to receive catalogues and information about customer events or you are interested in mail order, please send your full name and cell number to carolyn@carolynsshadegardens.com. Subscribing to my blog does not sign you up to receive this information. This entry was posted on January 15, 2013 at 7:33 pm and is filed under bulbs for shade, snowdrops, winter, winter interest with tags collecting snowdrops, galanthophile, galanthus, Galanthus 'Kite', Galanthus 'Lady Elphinstone', Galanthus 'Magnet', Galanthus Augustus, galanthus blonde inge, Galanthus Diggory, Galanthus Foxgrove Magnet, Galanthus nivalis, Galanthus reginae-olgae, Galanthus Straffan, Galanthus Viridapice, Matt Bishop, snowdrop articles, snowdrop bulbs, snowdrop catalogue, snowdrop plants, snowdrop provenance, snowdrops, snowdrops for sale U.S., snowdrops in the green, Snowdrops: A Monograph of Cultivated Galanthus. You can follow any responses to this entry through the RSS 2.0 feed. You can leave a response, or trackback from your own site. Beautiful and impressive article! Your photos are perfect. You must have been lying on your stomach to take them!! Snowdrops have always been a joy to see each spring after a long cold Michigan winter, and now I find I can try to grow them from fall to spring, thanks to all your writings. I admire your passion for snowdrops! Your garden must be wonderful, carpeted with these drifts of white. I think I like the fat Augustus! Simply Beautiful! The little variations are interesting. After learning about where snowdrops grow best, I’m actually entertaining ideas of moving to a climate that is more suitable for snowdrops so I can try all the different varieties. I’ve fallen gravely ill with “Galanthophilia”. Thanks for sharing so many wonderful pictures. I have just spent a very happy half hour re-reading your snowdrop posts and the link to John Grimshaw, thank you! Will certainly wait for the second edition of the snowdrop “bible” to be produced although it sounds as if it could be some time yet ! Thank you for those marvellous articles on snowdrops. I am a little addicted to snowdrops and I love to read about them. Like you I also have interest in the history of plants and I do research on the persons behind them, but even on the internet it seems hard to go back in time and to find information or pictures. I think we too will have to wait for the second edition of “Snowdrops” by Matt Bishop. Meanwhile I enjoy these little flowers in my garden although they are covered by a thick layer of snow right now. Congrats Carolyn for being asked to write an article for The Hardy Plant Society. I will be looking tomorrow too. I stopped at Diggory. It is unusual and caught my eye because of that. Augustus is different too, making it a garden standout. There is so much variation in this plant which you only see by looking close. What do you think of the new ‘Snowdrops’ book by Gunter Waldorf? I love them all! Beautiful photos. I wonder if ‘Galanthophilia’ is more prevalent around the rest of the world than here in England, where snowdrops are readily available and most are just as cheap as tulips and crocuses? OK, so there are some that would cost you an arm and a leg for just 5, but they are very rare, most are not expensive as such and easy to get hold of here, but I haven’t really heard of people going mad for them here in England, only from people abroad. It’s like with us and orchids, in the tropics they grow them everywhere, nothing special, but here they are highly priced plants that needs special this and special that, even special pots. I guess I might have missed the extent of the obsession because I get all my gardening info from watching TV and reading plant magazines and catalogues etc. and from the Internet of course. I am housebound and don’t meet other gardeners and never go to open gardens, shows, exhibitions etc anymore. I have been to RHS shows in the past, many years ago, I remember being to one solely dedicated to camellias, that was wonderful, came home with lots of photos on my camera, and also another one about orchids. By the way, my first snowdrop opened yesterday, despite the seriously cold weather we have right now! I adore them and could become quite obsessed were it not for my husband and his reminding me of our budget as I retire…so for now I will live vicariously through you and your beautiful snowdrops. How can you let a budget (or a husband) get in the way of a snowdrop. Just kidding, they can get quite pricey if you go beyond the tried and true. Great article! It is always intriguing what we gardeners become obsessed with – and how long it takes us to do so. It seems we all have one obsession, and after reading your article, I can understand your snowdrop obsession. I am especially impressed that they can give such a long bloom time, and of course, anything that blooms when everything else is dormant is most welcome. You are certainly a fan of Snowdrops! I enjoyed reading about thermogenic plants, fascinating. I will have to figure out a spot for some Snowdrops in my garden. I love the photos (not mine) in the thermogenic post of the little skunk cabbage “ears” peeking out of the snow. It is an amazing phenomena. Catherine, Your comment came through. It is annoying when you don’t get a message that it’s awaiting moderation and the comment vanishes into thin air. Not sure why that happens. 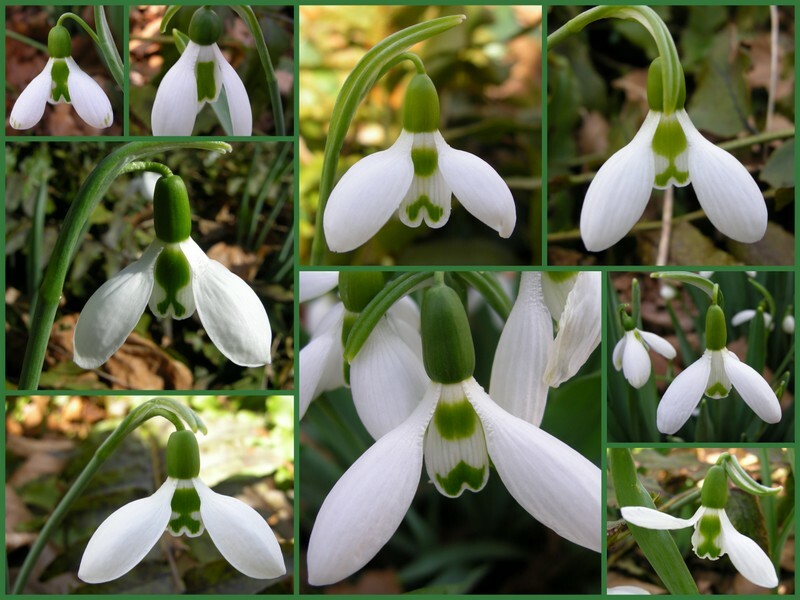 It is interesting that when it came to me picking some of my favorite images, every photo is of a single green-marked snowdrop, the exact cultivars that non-galanthophiles say all look alike. To me there is something pristine and elegant in them unmatched in any other flower. Hi Carolyn, the Snowdrops which you show us are indeed charming. Can you believe the ones in our garden as yet are not even peeking through the soil, yet some of the Daffs are. Congratulations! 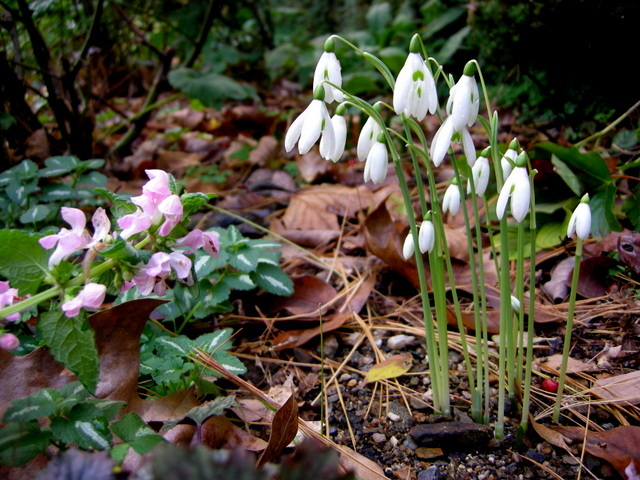 Great article, I will miss this year the snowdrops. Snow drops, They have always been my hope that “Yes” spring will come.